QT Office® Manager offers customer and inventory tracking for Mary Kay® Consultants, Directors and Nationals. 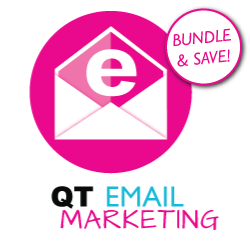 Mary Kay® Consultants, Directors and Nationals can use QT Office®’s Email Marketing to reach out to customers and consultants through email. QT Office offers many products for Mary Kay® Nationals, Directors and Consultants. We offer Unit and Area websites, Mary Kay® Software programs for taxes, customer tracking, inventory tracking and more. All of our software is cloud-based which means we work on Mac computers, Windows computers, Tablets and Smart phones. No matter your Mary Kay® career level we are with you Every Step of the Way! or click below to watch a short video about our most popular QT Office® products! QT OFFICE® has made having an international online home for our independent Mary Kay® business simple, beautiful and effective. We love being able to feature our awesome Global Fortenberry-Slate National Area on our QT site at www.PamSlate.com. Their support and professionalism is the best we've seen. WOW! Thank you QT Office® for making my website look and feel so professional! The content is AWESOME in the Training Center, the new documents every month are fresh and fun! My consultants are so excited to see what's next! The staff is so easy to work with and so accommodating! I feel like we have become fast friends and you have my business's best interests at heart! You are simply the BEST! I enjoy and love working with QT OFFICE®! The customer service is amazing, they are very professional, and my website is beautiful. Thank you QT OFFICE®. I absolutely LOVE QT Office® and would highly recommend it. I have tried other software products, but I felt like I always had my head in my computer instead of working with the people. QT Office® allows me to be quick and easy. It's so user-friendly that it hardly takes any time at all to keep all of my records up to date. Now, I am working with the people and not using all my time to keep my business updated in a computer. Thank you QT Office®! Thank you so very much for all that you do for me and my unit! We absolutely LOVE the app and are thrilled to stay ahead of the latest technology because of QT Office!! !